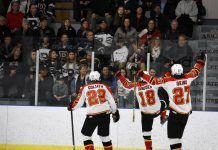 Vancouver, BC – Vancouver Giants forward Ty Ronning opened the scoring in front of his hometown crowd, but he and his Team Cherry teammates fell by a 3-2 score to Team Orr in the 2016 BMO CHL/NHL Top Prospects Game on Thursday. Ronning tallied the opening goal just 3:09 into the first period to ignite the Giants faithful, beating Everett Silvertips netminder Carter Hart who was in goal for Team Orr. The goal would be the only one Hart would concede as he turned aside 15 of 16 shots before giving way to Dylan Wells (OHL) midway through the game with the score 1-0. While Hart’s night was over, Moose Jaw Warriors goaltender Zach Sawchenko took over in net for Team Cherry halfway through the second period. Team Orr’s Pascal Laberge and Pierre-Luc Dubois went on to rattle off three points each in a winning cause. Laberge, with two goals, earned Jim Gregory Player of the Game honours as Team Orr took a sixth straight decision at the event dating back to 2011. Despite being outshot 36-27, Team Orr improves to an all-time mark of 13-4-0-0 in the event. 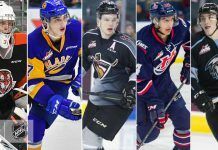 Hart was joined by Jake Bean (Calgary Hitmen), Brett Howden (Moose Jaw Warriors), Libor Hajek (Saskatoon Blades), and Simon Stransky (Prince Albert Raiders) on Team Orr. Ronning and Sawchenko suited up alongside Kale Clague (Brandon Wheat Kings), Dillon Dube (Kelowna Rockets), Lucas Johansen (Kelowna Rockets), Noah Gregor (Moose Jaw Warriors) and Sam Steel (Regina Pats) for Team Cherry. In total, 12 WHL players performed in the event. 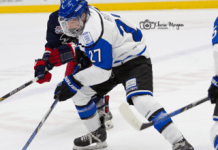 Top 2016 NHL Draft prospect and Vancouver Giants forward Tyler Benson was unable to participate due to injury.